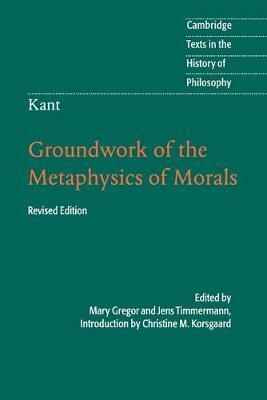 Published in 1785, Immanuel Kant's Groundwork of the Metaphysics of Morals ranks alongside Plato's Republic and Aristotle's Nicomachean Ethics as one of the most profound and influential works in moral philosophy ever written. In Kant's own words, its aim is to identify and corroborate the supreme principle of morality, the categorical imperative. He argues that human beings are ends in themselves, never to be used by anyone merely as a means, and that universal and unconditional obligations must be understood as an expression of the human capacity for autonomy and self-governance. As such, they are laws of freedom. This volume contains Mary Gregor's acclaimed translation of the text into English, revised by Jens Timmermann, and an accessible, updated introduction by Christine Korsgaard. Preface to the revised edition; Introduction; Chronology; Further reading; Groundwork of the Metaphysics of Morals; Preface; 1. Transition from common to philosophical moral rational cognition; 2. Transition from popular moral philosophy to the metaphysics of morals; 3. Transition from the metaphysics of morals to the critique of pure practical reason; Notes; Selected glossary; Index. "...Groundwork of the Metaphysics of Morals is an original, profound, and beautifully written piece." Christine M. Korsgaard is Arthur Kingsley Porter Professor of Philosophy at Harvard University. She is the author of Self-Constitution: Agency, Identity, and Integrity (2010), The Constitution of Agency (2009), The Sources of Normativity (Cambridge, 1996) and Creating the Kingdom of Ends (Cambridge, 1996). Jens Timmermann is Reader in Moral Philosophy at the University of St Andrews. He is the author of Kant's Groundwork of the Metaphysics of Morals: A Commentary (Cambridge, 2007) and Sittengesetz und Freiheit (2003). He is the editor of Kant's Critique of Practical Reason: A Critical Guide (with Andrews Reath, Cambridge, 2010) and of Kant's Groundwork of the Metaphysics of Morals: A Critical Guide (Cambridge, 2009).